Dental care is just as important for dogs and cats as it is for humans. Without it, our pets are prone to painful conditions such as tooth decay and gum disease, which can lead to more serious health problems. 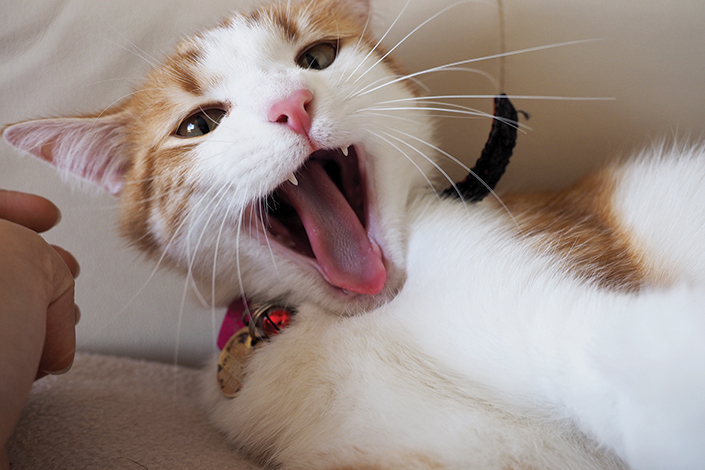 August is Pet Dental Health Month – an initiative of the Australian Veterinary Association. To promote the oral health and well-being of our pets, we’re taking a look at some frequently asked questions about pet dental health. How often should I check my pet’s teeth and mouth? A dental check will form part of your pet’s annual vet check. However, it’s a good idea to check your pet’s teeth at least once a month. Regular checks mean you’ll quickly notice any changes to your pet’s teeth or gums. What signs of dental disease should I look out for? Excess tartar: A build-up of tartar on the teeth will cause bacteria to develop, eventually resulting in gingivitis and periodontal disease. Broken teeth: Broken or fractured teeth can be caused by chewing on hard objects or from trauma, such as rough play or a fall. If left untreated, this can lead to inflammation and infection. Gingivitis: Gingivitis is inflammation of the gums, caused by a build-up of tartar on the gum line. It’s a painful condition and if left untreated, can lead to gum disease. Gum disease: Gum disease or periodontal disease occurs when a build-up of tartar spreads between the teeth and gums. This causes the teeth and bone to gradually breakdown, with the teeth eventually falling out. The infection can spread into the bloodstream, leading to very serious health issues, such as heart disease or infections of the heart, kidneys or liver. How can I look after my pet’s teeth? Feed your pet good-quality dry food, as this helps to remove tartar from the teeth. Regularly brush your pet’s teeth, if they’re comfortable with this. A weekly brush will make a difference to their dental health. If your pet is prone to dental disease or has had dental problems in the past, consider feeding them a specially-developed dental range of food. You can buy this at vet clinics. Give your pet chew treats, such as tendons, cartilage or raw bones. Never give your pet cooked bones, as these can splinter and pose a choking hazard. Throughout Pet Dental Health Month, the Frank Samways Veterinary Clinic is offering free dental checks for dogs and cats until 31 August 2016. Certain dental procedures are also being offered at a discounted rate, dependent on the type of procedure and animal. Bookings are essential. For more information and to book, call the Clinic on (03) 9329 2755.